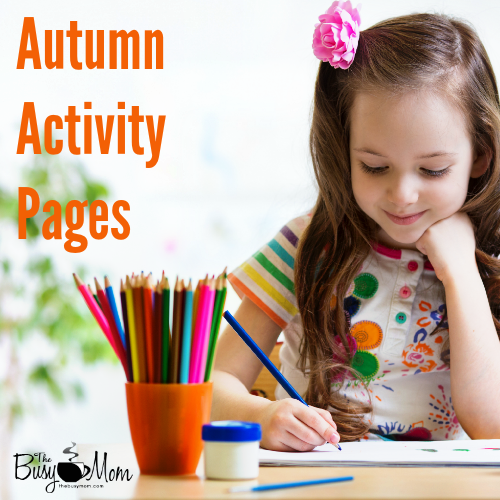 I love a good season-themed activity pack to give my two youngest. This month I created this cute printable pack that my almost-four-year-old and six-year-old can both enjoy! 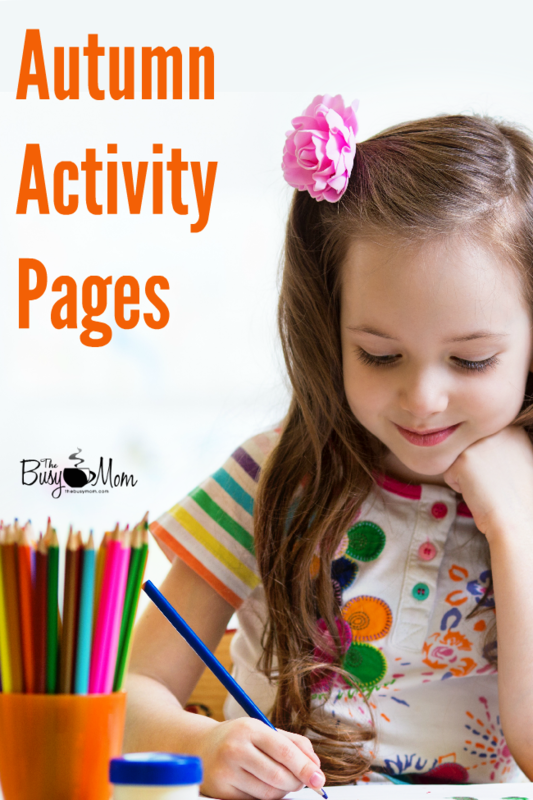 To download the Autumn Activity Pages click HERE. I’ll be honest and admit that I am not a crafter. I want to be! I yearn to sew and knit and crochet. I want to be one of those moms who has a closet of craft supplies (which she knows how to use) at the ready. The mom who can make something beautiful out of a snippet of construction paper and a sprinkling of glitter. But I’m not. I’m the mom with one small drawer of crayons, glue, and construction paper. Craft days are saved for “when we have time”…and we usually don’t. I don’t own a glue gun. And, until recently, mod podge was an intimidating foreign substance. It’s not that I don’t like crafts, I love them. They excite me! However, crafts simply overwhelm me. Projects seem more complicated in my mind than they are in reality. However, I’ve learned a very special lesson that is helping me overcome my craft aversion. Crafts are not about the project, the mess, the detail or even the outcome. 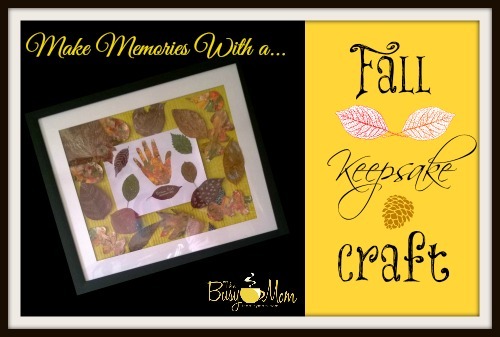 Crafts are about making memories with your children. When I look at it like that, crafts suddenly seem much more important. That’s why I’m making a conscious effort to add more crafting to our life. I want to make memories! 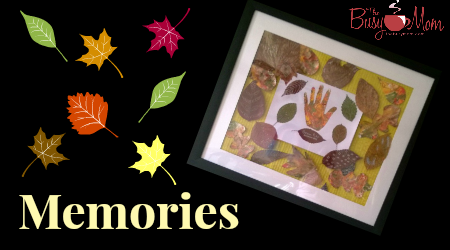 So, for my first project, I decided to make an autumn keepsake with my son, not just another “craft”. I love this keepsake craft for four very specific reasons. 1) It has variety! The different materials give it more depth. 2) It can be broken down into several smaller projects. We had 4 different days of crafting. 3) You can make this keepsake no matter what climate you live in, using whatever items you have outside. 4) It easily adapts to different seasons by changing the outdoor items you collect and paint colors. Step 1: We started with a “leaf walk”. The kids had a blast walking our property and collecting leaves of all different shapes, sizes and colors. If you live in a hotter climate, or your leaves have already dropped, collect pebbles, wide-leafed grasses, etc. You can even use brown, dried leaves if they’re not too brittle. Don’t forget to collect a few green leaves for contrast. 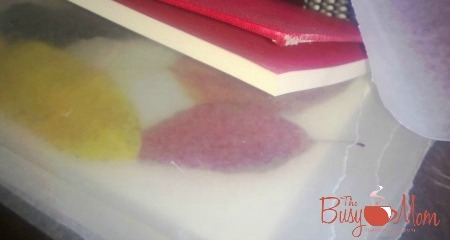 Step 2: Press the leaves between the pages of the books, lined with waxed paper. 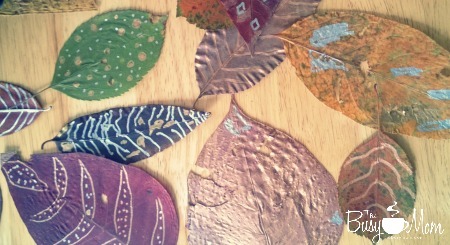 Step 3: When the leaves are sufficiently pressed, carefully color them with the metallic markers. Get creative with designs. The colors really pop! When you’re happy with your leaves, set them aside. Step 4: Using scissors, cut leaf shapes out of the cardstock. You can do maple, oak, or freestyle it! This is about memories, not perfection, right? Step 5: On a piece of waxed paper or in a rectangular dish, spray a layer of shaving cream and smooth it out. Next, add drops of the acrylic paint all over. 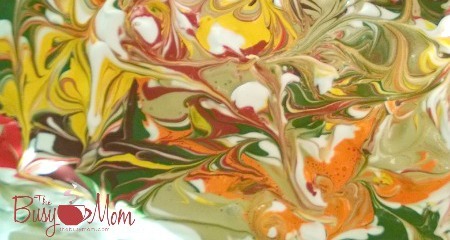 Then, using the toothpick, swirl the paint until it has the design and pattern you like. Step 6: Press the cardstock leaves face down into the shaving cream/paint mixture. Let is sit for just a moment, then carefully lift out the leaves and lay them paint side up on a piece of waxed paper. Step 7: Allow the leaves to sit for a minute or two. Then, using your spatula, scrape off the excess paint and shaving cream. Allow your leaves to dry well. Step 8: Once everything is sufficiently dry, arrange your varying leaves on another piece of cardstock in any design you wish. 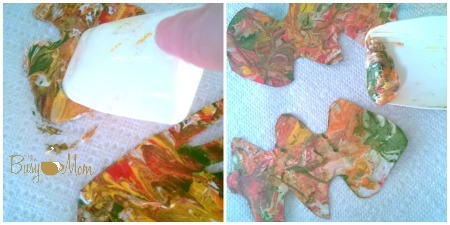 Then, use the mod podge to glue the leaves securely. Apply a very thin layer with a paintbrush or sponge. Also, be sure to coat the tops of your leaves with mod podge as well. It will enhance the colors and give them a bit of luster! Dry well. All that’s left to do now is frame your masterpiece. Ours is hanging (on proud display) in our living room. My son likes to gaze at it every so often and comment on the fun we had making it. And that’s what crafts are all about. The happy memories! Are you a crafter? How often do you incorporate crafts into your home? I was born in upstate New York. I have always loved the colors of fall. God was not stingy with His color palette. I remember how the cool breezes danced red maple leaves across our lawn. The smell of homemade applesauce lingered throughout the house as we all started to bundle up by the year’s first fire. These are some of my fondest memories. Now as a mom I live in Florida. Hot, humid, green Florida. If I want my boys to enjoy striking fall colors and crisp weather we have to leave the state. A few years ago my husband and I started a new tradition for our family. We make sure not to miss the peak fall season. Each year we plan a fall family getaway. Last year we had the amazing opportunity to spend time in Yellowstone and Yosemite National Parks. This year we just returned from camping in the mountains of western North Carolina. As I get a bit older I’m learning that there is so much more to fall than a kaleidoscope of colors. Fall offers us a time to look back – individually and as a family – over our year and plan to finish well. Fall offers change. A change of scenery, temperature, food, and clothing. It’s time to discuss with my boys if they are seeing change in their own lives. Are they maturing? Are they growing spiritually? Do I notice a difference in my spiritual walk? 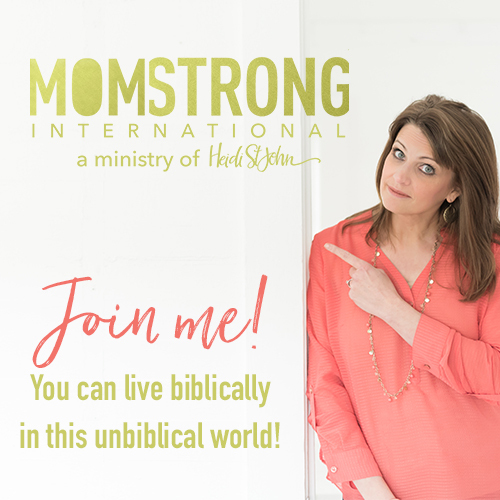 Is God’s Word taking root in my heart and changing me? Fall offers beauty. A time of colorful ripe harvest. 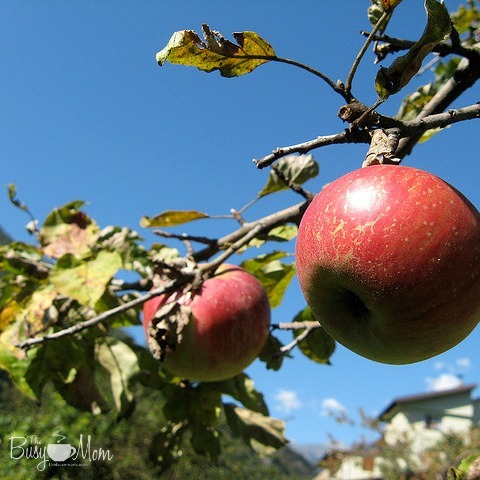 Are we producing a healthy crop of spiritual fruit? Does our light shine like Sugar Maples at sunset? Am I showering grace down upon my children with each breathe? Fall offers peace. An opportunity to rest and just be still. Can we name the things that distract us? Are we spending enough time in God’s Word? In prayer? Are we peaceful or anxious? Do we praise God for the work He is doing in ourselves and speak it to each other? We have become busy people. Many things tug at our time, attention, and our hearts. We rush far too often. The possibilities of fall are meaningful when we allow it to linger. Set aside purposeful time with your family to enjoy God’s creation. Before fall fades, mark your calendar for a time of personal evaluation. Sing out thanks as your family prepares for advent. You can finish this year as strong as you started! 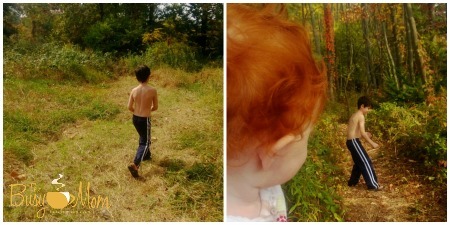 Check out this Nature Study from Five in a Row as a way to enjoy fall with your family! 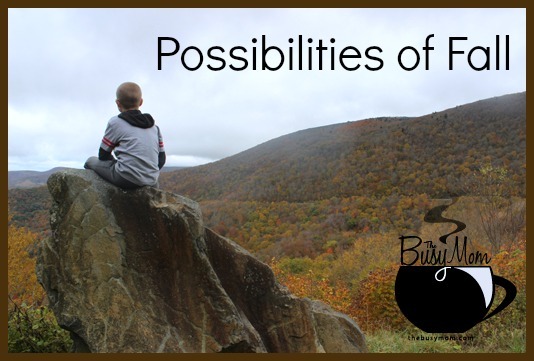 With the advent of the autumn season comes much opportunity to reflect upon the blessings God has bestowed upon us. Along with the more obvious day of gratitude, Thanksgiving Day, comes a lesser celebrated day, Veteran’s Day. November 11, Veteran’s Day, is the one day set aside each year to honor the patriotism, love of country, and sacrifice of all those who have served in the Armed Forces of the U.S., including those currently serving. For several years now, our family has attempted to repay that service in a very small way — by sending care packages to our troops. This small token of gratitude is amazingly meaningful to those who have received our simple gifts. When you’re far away from home and those you love, it doesn’t take much to make your day. A box of toiletries, a pair of socks, some much coveted beef jerky — things most of us pass by on our weekly grocery store visits — become priceless treasures to those living in less than desirable conditions. Today, I want to help your family serve in this way as well, by sharing three different themed care packages that can be easily assembled for about the cost of an average family’s trip to a fast food restaurant, as well as some tips for sending care packages to our troops. 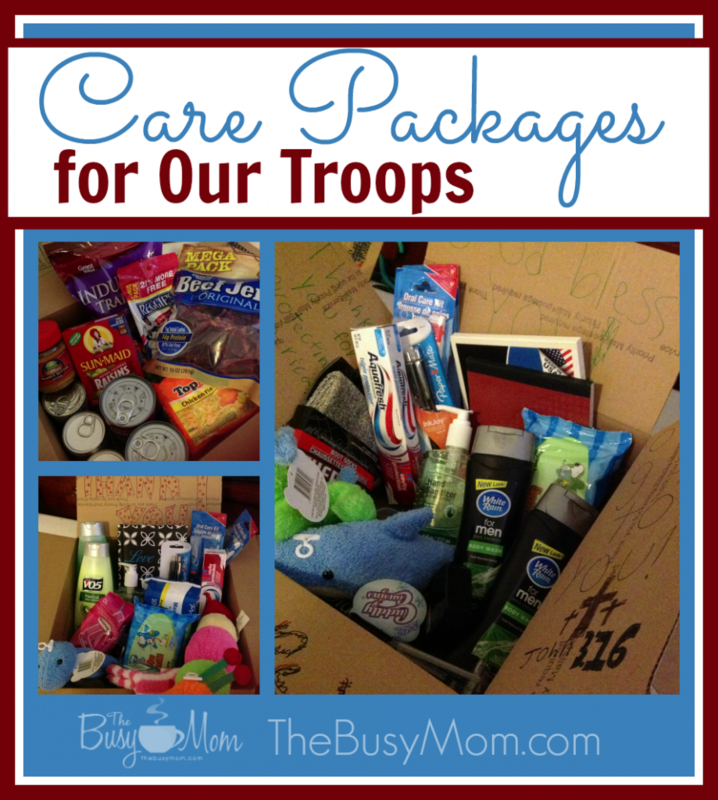 What do I need to know about shipping care packages? 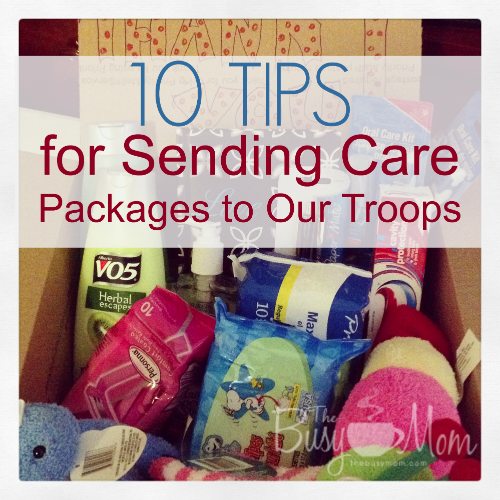 I’m glad you asked, because there are a few things you need to know, including some hard and fast rules about sending care packages. No obscene or pornographic articles are permitted (prints, cards, DVDs, etc). Non-authorized political materials are not permitted. Bulk quantities of religious material contrary to Islam are not permitted (items for personal use are allowed). Pork or pork by-products are not permitted. Each care package mailed must be accompanied by the customs form found here. Be sure you read the instructions for how to complete the form properly. Any errors and your care package may not be delivered. My personal preference for packaging is the large Priority Mail flat rate box. The shipping rate for this box is $16.85 no matter how heavy it is, and the post office will discount that to $13.30 for boxes going to an APO/FPO address. The boxes are free for the taking at your local branch of the USPS or you can order them online here. Chocolate should not be included in care packages, especially during the hot summer months. Shop at your local dollar store. We were able to fill two boxes of toiletries for less than $40. Our food box was more expensive because we needed to head to the grocery store for much of the food. That box came to about $35. Still that’s three care packages for $75, or an average of $25 each. Many families will spend $25 driving through a fast-food restaurant! Don’t send homemade food items. Shipping times may be delayed, and these foods could spoil. Place anything liquid (shampoo, body wash, etc.) into plastic zipper bags in case they spill. Generally speaking, you should choose a theme for your care package — toiletries, food, or entertainment. There can be some crossover between the three, but for the most part, boxes that contain toiletries should not also contain food. I find it much easier to pack according to theme. For this Veteran’s Day, we chose to pack 2 boxes with toiletries (one for a man, and one for a woman) and 1 box of food items. Below are list of items you might consider including for each box. How do I find a soldier for my care package? Most of us know someone who has a loved one currently serving overseas. Ask around, post a message on Facebook, or ask your pastor. If you can’t find a connection through your friends, family, or church, there are several ministries who match soldiers with families who wish to send a care package — AnySoldier and Give2theTroops are two such organizations. In the past you could just address your box to “Any Soldier” and it would be distributed. It is my understanding that is no longer acceptable. Be sure to include a card or letter, expressing your gratitude to the soldier who will receive your care package. Also include your email and/or snail mail address if you would like to receive a reply from your solider. Have your children draw pictures and/or decorate the inside of your box with drawings, messages, and stickers. Children of all ages will enjoy taking part in this effort, from planning the shopping list to packing the box. This is such a simple way to show our gratitude and be the hands of Jesus during a trying time in the life of a soldier. May God richly bless our efforts. How about you? What are some of your favorite Family Projects? Fall is the time of year when most of the animal kingdom is storing up food and extra fat layers for winter. That doesn’t mean we have to! Fall can be the perfect time to make some positive changes to your health and fitness routine – or start one! My first successful weight-loss story (because there were a bunch of unsuccessful ones) began in the fall. More specifically, it began the week of Thanksgiving 2009. Yes, you read that right. I made one last ditch effort to change my life four years ago and I decided to begin three days before Thanksgiving. I lost four pounds the week that most people gain that much. 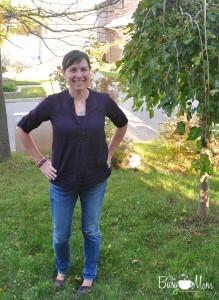 So, why is fall such a great time to begin to write your weight-loss success story? One of the best reasons is the fact that the cooler weather makes fall a great time for becoming more active. Whether you’ve been stuck in a stuffy gym all summer or have been pouring sweat being active outside, the crisp air and gorgeous colors lend a new excitement to getting outside for running, walking, biking, or whatever you enjoy. If you have been active outdoors all summer, the lower temperatures make it easier to go farther and pick up the pace. Even if you live in an area of the country where fall is really cool, my outdoor workout philosophy is: When it’s cold outside I know I’m going to warm up once I get moving; when it’s hot outside, I’m only going to get hotter. In addition to the cooler weather, the influx of a whole new batch of seasonal produce is the perfect catalyst for getting out of mealtime ruts. Apples, the quintessential fall fruit, make a delicious, healthy snack – as long as you’re not baking them in a pie or frying them in a fritter every time you eat them! An apple along with a piece of string cheese, some yogurt, or peanut butter are all excellent choices. In addition to apples, fall is a great time for soups. Most broth-based soups are good, healthy choices. With all of the fall produce, a veggie stew or even chili with lean meat (or no meat) makes a quick and easy lunch or dinner, especially when you add the convenience of a slow cooker. Maybe one of the best reasons to revamp your health and fitness routine (or start one) is the simple fact that fall is followed by winter. You know what that means – Thanksgiving, Christmas parties, candy, baked goodies and a generally more sedentary season. If you start improving your exercise and eating habits now, they’ll be well on their way to becoming habit by the time temptations become abundant. Not only that, but the darker, shorter days of winter can result in the onset of seasonal depression for many people. A healthy diet and regular exercise can go a long way toward alleviating those symptoms. It’s hard to convince yourself to eat right and exercise once those blue feelings have begun, but much easier if those good habits are already in place. It doesn’t matter if you’re already somewhat active and eating well or if you haven’t even begun to make the changes you’d like to make. 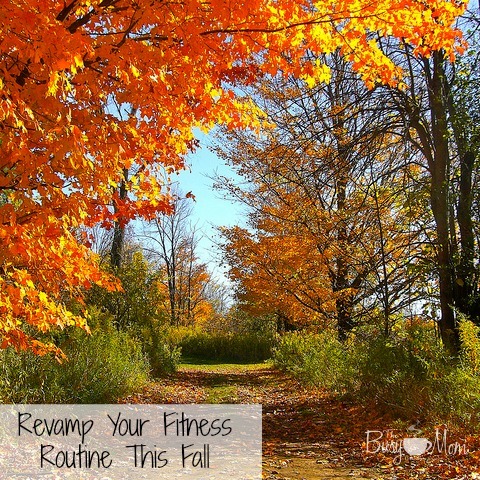 Fall is a great time to revamp your health and fitness routine – or start one! The sense of purpose can be very motivating. What changes do you need to make to improve your overall health and activity levels? Fall is here. The weather is cooling off and the holidays are just around the corner. With the holidays come many traditions that families hold dear. Memory making times that will be passed down from generation to generation. This year, our family is starting a new tradition. A tradition of serving – together. Traditions not only provide our kids with a strong sense of belonging and security but they also teach a cultural heritage and solidify our individual family values. 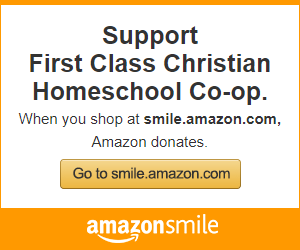 So why not make serving together as a family a tradition in your family? I love that the holidays begin with our entire nation observing the tradition of Thanksgiving Day. Don’t we have so much to be thankful for? It is easy to take for granted our freedoms of life, liberty and the pursuit of happiness. Practicing thankfulness is an excellent way to begin teaching kids about service. I know that when I make a habit of being thankful, my own heart begins to overflow with gratitude and a strong desire to give back a bit of the blessing that I have received. Ask your kids to brainstorm ideas for who and how they can serve. Encourage them to think not only of ways that they would enjoy serving (like the Play-Doh lunch) but ways that are a real need but maybe not so fun. Neighbors are an excellent place to start. Is there someone you can think of who needs some yard work done? A meal cooked? An afternoon of babysitting? Churches are often in need of painting, cleaning or caring arms to read and tell about the love of Jesus in the children’s ministry. Family members are often overlooked. Does Mom need a back rub? How about cleaning out the garage for Dad? Surprise a sibling by doing one of their chores. Consider writing letters of encouragement to far off relatives? Contact a local homeless shelter or food bank to look for opportunities to serve. Serving together as a family is surprisingly fun! There is something about working together that unifies and strengthens family relationships. When we take our eyes off of ourselves to help others, suddenly our problems don’t seem so bad. When we help our children experience the joy of serving, we are actually teaching them to become lifelong servants. Statistics show that adults who volunteered as children give more money and volunteer more time than adults who began serving later in life. Other research links mental and physical health benefits with servanthood. Still not convinced serving is a good idea? 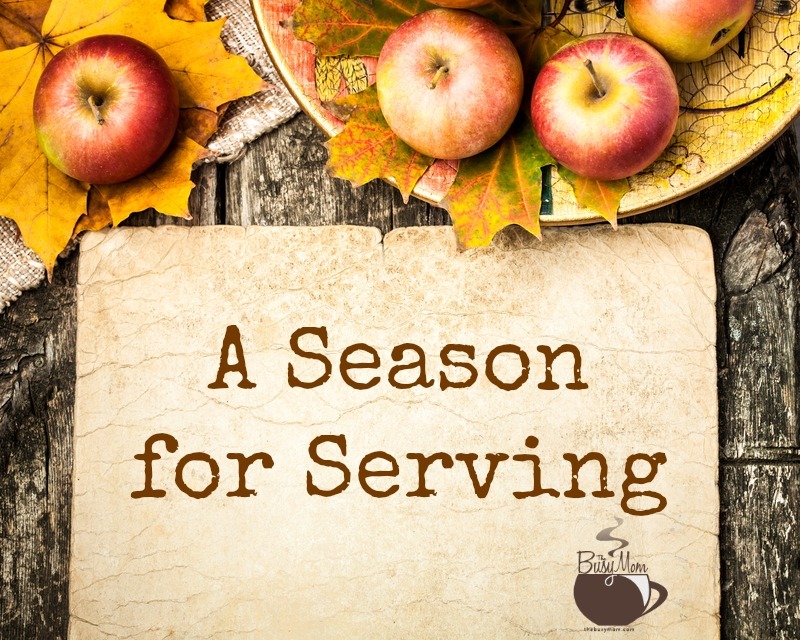 As our little corner of the earth quiets down for the Fall and Winter, consider the blessing and the benefits of serving together as a family. Find a way to bless others and be blessed yourself! Fall is a BEAUTIFUL time of year. In many parts of North America we experience a gradual change in weather – from the hot, humid, still days of summer, to the cool, drier, breezy days of fall. The mornings and evenings are crisp, the smell of earth is in the air, the leaves are changing color – and so do our wardrobes! It is important for a woman to take care of her appearance. Our focus should always be first on our inner beauty and relationship with Christ, but there is nothing wrong with dressing nicely and fashionably. Even the Proverbs 31 woman is described as being dressed in fine linen and purple! As a “new” mom again this fall (my baby girl is just about 10 months), I’ve been having some fun putting together outfits, incorporating some of what I already have in my closet, along with some new transition pieces. Finding the balance of versatility as a nursing mom, going for comfort and style, while still trying to work with a post-pregnancy body, may present some challenges. 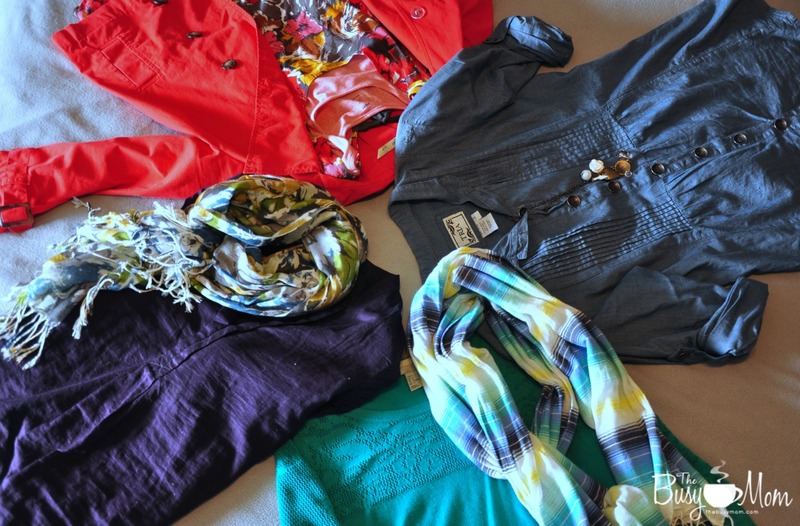 I hope that the ideas here will encourage you to take charge of your body and wardrobe, and give you some ways to enjoy getting dressed comfortably, but nicely, for fall. Let’s start by talking about tops. Shirts, tanks, Ts. Nothing fits quite right and you don’t have a lot of money to spend on new items. Tank tops and t-shirts paired with cardigans work well for the cool mornings. If you find your current shirts are a little short, invest in a couple of nursing tanks (my favourites are from Undercover Mama) to add length and stay covered up. Button-down blouses or shirts are an easy way to add something different to your wardrobe. Tunic and looser fitting tops allow for extra room in the tummy area and are loose and comfortable for everyday, but still stylish enough for going out (even if it IS just to get diapers!). Short-sleeve everything is perfectly all right, as body temperatures for a mom tend to change very quickly! Avoid wearing heavy sweaters (unless it’s really cold and you’re going to be outside) and instead layer up with lighter-weight shirts and cardigans. Leggings or jeggings are a LIFE saver. They stretch everywhere you need them to without losing shape. 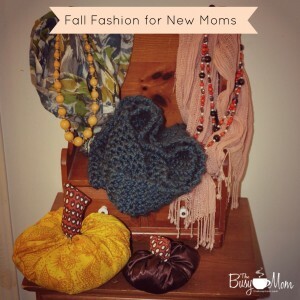 Wear them under a dress or with a tunic top for a comfy yet fun fashion look. Pull on a pair of boots and you are all fall-ready! High-rise or mid-rise jeans do NOT work for everyone. But I loved wearing them while I was waiting for my other jeans to fit again, as I didn’t have to worry about the muffin top. It’s a nice way to stay fashionable while comfortable. Dresses have to be the most difficult article of clothing to work around as a new mom. Our shapes are all different and a lot of dresses don’t fit us well. But armed with a few tips, you CAN find some fun little pretties that will bring a smile to your face. Try to avoid jersey dresses – these hug right where you don’t want them to and tend to stretch out oddly. Go with a thicker cotton blend instead, with a little bit of stretch. Partial-button down in the front is a great idea for quick and easy baby access. Another option is a dress with straps that will slip off easily. Since you will most likely be carrying your baby in your arms a lot, you don’t want to have to fiddle around with fancy footwear too often. Keep things simple – a slip on pair of shoes, pull on boots and low-rise heels will add the extra touch for when you’re ready to go out, while still keeping your feet (and back) supported. 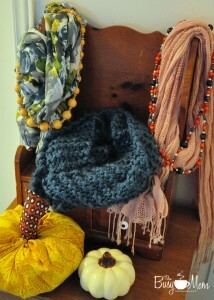 One of my favourite things about dressing for fall is the accessories! You can add a lot of beauty to a simple outfit with just a couple of extra touches. Scarves – oh how I love scarves! There are so many creative ways out there to tie them, so even if you only have a scarf or two, you can always make it look different! If you are able to get an oversized scarf, you can also use it as a nursing cover. Don’t be afraid to mix and match colours and patterns with your tops. Jewelry – if you have pierced ears, change out your earrings to coordinate with your outfit once in a while. Just make sure little baby hands can’t get a hold on them and pull! Necklaces are fun and easy to find for cheap, plus they’re a great emergency occupation for a babe-in-arms when we’re stuck in the check out line. Add some colour to your nails and bangles to your wrist – they double as a great nursing reminder too. Black is STILL the new black! (Not to mention it’s extremely slimming.) BUT don’t be afraid to add some colour to your wardrobe, even if it is just in the form of accessories. We are surrounded by so much of the beauty and inspiration of fall that God has created, enjoy it! Think rich purples, greens, blues and yellows. Now before you go saying you don’t have any money to spend on a new wardrobe, there are ways to find new things for reasonable prices, if not even free. Shop your friends’ closets, trade clothing and accessories and you’ll be amazed at the new combinations you can come up with. Pick a few key, versatile pieces to add to your wardrobe that can be accessorized in order to create a number of different outfits. Check out second hand stores or online sales. Combine coupons and deals to get the best price for your dollar. 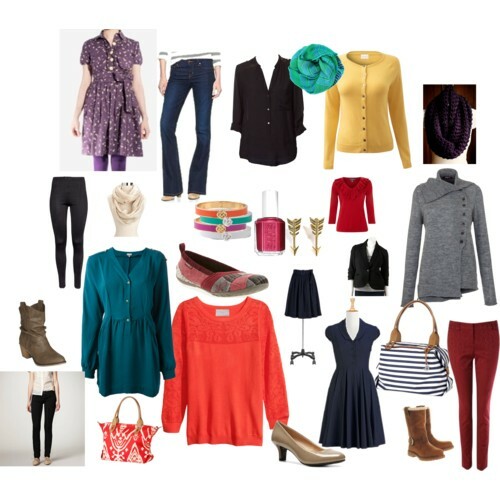 What are your favourite fall wardrobe pieces?